There is one important thing that I finally figured out as I was prepping this review. I always thought that Bridget Moynahan and Michelle Monaghan were sisters. As it turns out, they aren't related. In fact, they spell their last names completely different. Yep, my mind was blown. My mini faux pas aside, Lord of War is that mid-2000s film in which Bridget Moynahan appears for a few scenes, along with some other guys you might know such as Nicholas Cage, Ethan Hawke and Jared Leto. The film is based on the true story of a successful arms smuggler who plied his trade for over 20 years making a very lucrative living. While the film packs a serious punch at times, there are several satirical scenes that will conjure up the more modern The Wolf of Wall Street. Although, that film takes place during the late 1980s and early 1990s which would place both films during the same time period. In any case, both films celebrate the virtues of excess in a morally ambivalent world in which the final judgment is only one subpoena or bullet away. Can we talk a minute about Nicholas Cage? People will forget that he actually won an Oscar for Best Actor for his performance in 1995's Leaving Las Vegas, but his career has been anything but stable. The highly animated actor has seen his roles fluctuate with his onscreen persona, but when the material is there, he can be brilliant onscreen. Lately, it seems that his movie choices haven't been the best and I struggle to remember the last great Nic Cage performance. He's basically become a caricature of himself in which he simply goes all manic in the hopes of capturing some sort of fleeting glory in the less than subpar material that he has been given. But there was a time when Nic Cage was on top of the world and Lord of War was a film that he put out towards the end of his brilliant period and it really showcases the actor's strengths beautifully. 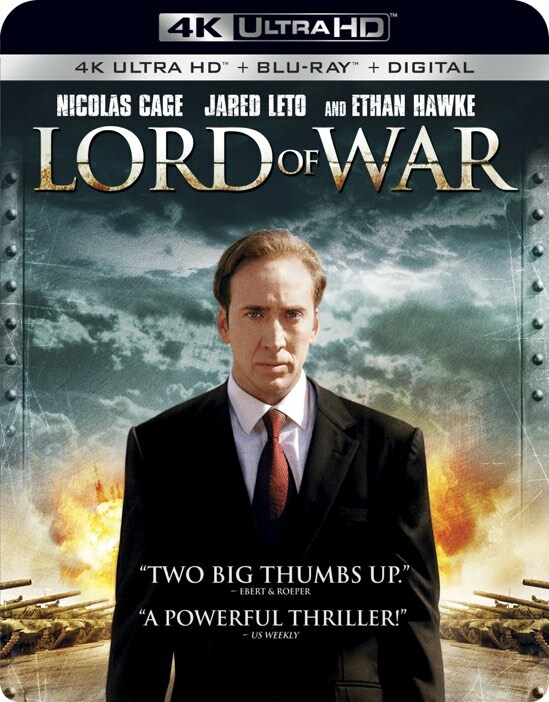 Lord of War chronicled the end of the Cold War and the subsequent proliferation of Russian guns and armaments to third world countries by a man who had to be insane to risk his life with each and every deal with a rising dictator or warlord. If there was ever an actor crazy enough to encapsulate the sheer boldness of this type of person, it is Lord of War. This film is directed by Andrew Niccol, who came onto the scene with the wonderful Gattaca. He has yet to capture that same lightning in the bottle for any of his following films, but Lord of War comes as close as any in showcasing this filmmaker's promise. While Niccol is perhaps more comfortable in his primary genre of Sci-Fi, he proves with this film that he isn't just a one-trick pony. The supporting cast is also impressive as Ethan Hawke turns in a top-notch performance as Interpol agent Jack Valentine. Every good morally ambiguous protagonist needs a straight and narrow antagonist and Ethan is more than ready to play Nic's foil. Jared Leto is always great and his performance here is no exception. Believe it or not, Jared actually plays against type as the gunrunner with a heart of gold and it's an interesting twist from the usual tropes from this genre. The film finds its 4K UHD release at an opportune time when the topic of guns and gun-related deaths has never been more under the microscope. The film contained a powerful message when it was released almost 15 years ago, but the need for its lesson has only increased since then. You only have to read the daily paper's headline to see the impact of the illegal gun trade on today's society. The 4K UHD has a superb video transfer that cleans up most of the imperfections that you can still see on the included Blu-ray. The Dolby Vision transfer with HDR really provides a brilliant picture that shines during the scenes meant to glamorize the illegal arms business. Likewise, it also provides a sharp punch in the gut in the many action scenes with spectacular explosions and realistic gunfire. Perhaps the best sequences though are those that contrast from these and are minimally lit. In particular, the scene with Bridget Moynahan calling Nic Cage to inform him that their trash was being examined provides sharp contrast that simply jumps off the screen. The new Dolby Atmos audio track is a significant improvement over the old DTS track on the Blu-ray. With so many bullets and explosions, a film such as Lord of War necessitates the best audio treatment available and the Dolby Atmos track is the best of the best. It provides a more robust sound and the channels mix perfectly during the action sequences to make it seem like you are literally sitting in the middle of a gunfight. The included bonus features are the existing ones that were previously available on the Blu-ray, so that's a bit of a disappointment. After 15 years, it would have been nice to rouse Nic Cage from whatever B-movie he is currently filming to get his thoughts on the film and its legacy in a world that is increasingly becoming perilous when it comes to illegal guns. Alas, the bonus features are nice, but it would have been nice to have a few newer things to help justify the upgrade. As it stands, the film alone is worth the buy or upgrade to 4K UHD in my opinion as it really showcases the format properly. There are great performances here and the film was sadly not seen by as many people as it should have been when it first came out. Lord of War is now available on 4K UHD Blu-ray.